Ulrich Ostergaard top scored for Panthers at Workington. Peterborough Panthers team manager Carl Johnson called for a review of the British speedway fixture list following a farcical defeat last night (September 2). The city team suffered a sixth successive away loss when being beaten 58-34 at Workington in the SGB Championship. Adam Roynon recorded a heat win for Panthers at Workington. The outcome was no surprise given Panthers were without their two leading riders – Jack Holder and Chris Harris – and unable to attract guests of the required standard. Holder was part of the Australian team who finished as runners-up in the World Under 21 Team Cup while Harris was racing in the latest round of the World Long Track Championship. But Panthers had to operate rider replacement for Holder, who is back at number one in their averages, and tracked a National League guest in place of Harris. Cradley man Joe Lawlor stepped into that role at short notice after the rider actually booked by Panthers – Steve Boxall of Plymouth – failed to show up in Cumbria. Former Panthers Craig Cook delivered a maximum 15 points for Workington. Lawlor was already present at the track for a second-half fixture and was praised by Johnson for stepping into the fold. “It seems to be a case of far too many meetings being squeezed into too short a time at the moment,” said Johnson. “The fixture list has been crazy in the past week and we’re certainly not the only team who has struggled to find guests. “There were four SGB Championship meetings last night which meant only two teams at our level weren’t racing. “We tried virtually every possible rider to guest and they were either unavailable or not interested. “It is a really big ask to go into a meeting without suitable guests for our top two riders. Even one of the riders we did manage to book then didn’t turn up! Captain Ulrich Ostergaard was the pick of the Panthers’ performers with a 12-point haul. That included four points earned in a seventh heat tactical ride when he was beaten into second spot by fellow Danish rider Thomas Jorgensen. Ostergaard provided one of Panthers’ three race wins. The others came from reserve Simon Lambert (when leading home partner Tom Bacon for a 5-1 in heat two) and guest Adam Roynon (who no doubt enjoyed his heat eight triumph against the club that axed him earlier in the season). But it was a tough night for the usually reliable Paul Starke as he suffered two retirements and recorded only three points. Jorgensen and Craig Cook, who spent much of last season riding for Panthers, both recorded paid 15-point maximums for Workington. Panthers are back in action today (September 3) when they entertain Glasgow at the East of England Arena (7.30pm). Team boss Johnson is keen for a repeat of his side’s biggest and best league win of the season when beating the Scottish side 55-37 at Alwalton back in June. Panthers will be spearheaded by two of the leading British riders of this century on this occasion. Harris returns to the fold and is joined by guest Scott Nicholls, who fills in for Holder. WORKINGTON: Thomas Jorgensen 14+1, Craig Cook 13+2, Ty Proctor 9+1, Matt Williamson 9, Mason Campton 8+1, James Sarjeant 3+2, Tom Woolley (guest) 2. 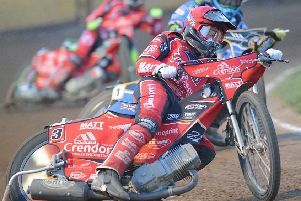 PANTHERS: Ulrich Ostergaard 12, Adam Roynon (guest) 7, Simon Lambert 6+1, Tom Bacon 4+1, Paul Starke 3, Joe Lawlor (guest) 2+1, Rider replacement for Jack Holder. * Holder scored a dozen points to help Australia finish as runners-up in the World Under 21 Team Cup Final. Hosts Poland triumphed at Rybnik yesterday.